Get ready for phase two of the 2011-12 Euroleague season, as today league officials will be determining the groupings for the Top 16 round. BallinEurope will be watching the live stream over at Euroleague.tv, though quite a few nations — Spain, Greece, and Israel among them — have local sports stations shows the draw as it happens as well. 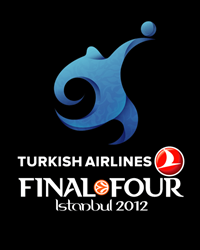 Logo at left will be that of the 2012 Euroleague Final Four, just released/announced in the runup to the draw this afternoon. The groups in the quest for that EL Final Four bid will be comprised as follows. • How about that mini-Endesa Liga in Group F? Three Spanish sides plus Montepaschi Siena? BiE doesn’t know if that’s the oft-created “Group of Death,” but BiE’ll take it as the highest-scoring overall of these groups. • BiE also digs the pairing of FC Barcelona and Maccabi Tel Aviv, both Final Four-Fearlessly Predicted™ teams — can’t wait to see that game early … and maybe later, too? • Considering Group E, BiE’s hedging bets that CSKA Moscow extends its run to 16-0 going into the elite-eight tournament.